For a definition of what a Package is in the SubscriptionBridge system, please see the Glossary. Select the Plan that you would like to use for this Package. If you don't remember the properties of a specific Plan, select it and click on Display Selected Plan's Details to load a window that shows you details about it. If you want to create a new Plan, you can do so without leaving this page by clicking on the Add Plan link: a window will appear and allow you to enter the new Plan's details (refer to Adding & Editing Plans for instructions). When you save it, the new Plan will appear in the Plan drop-down menu. Enter the Package price. This represents the regular subscription amount that your customers will pay when they subscribe to this product or service. 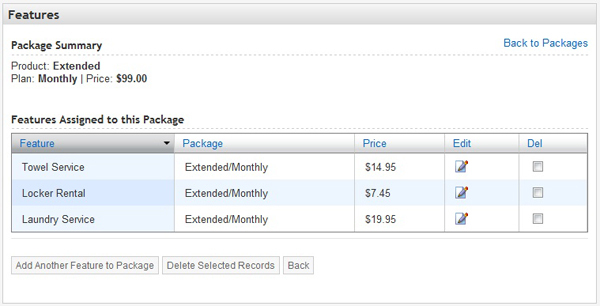 If the selected Plan includes a Trial Period, the following two fields will be displayed (the second one applies only if the Package includes a shipping product). Enter the price that customers will pay for this Package during the Trial Period. For example, if you want to offer a 30% discount for the first 2 months of a monthly, ongoing subscription to a certain product or service, in the Trial Price you will enter a price that is 30% off the “Price” entered above (i.e. 30% of the Package Price). This feature allows you to reduce the shipping charge associated with a subscription that includes a Product that requires shipping. For example, if you wanted to provide a free trial for a certain subscription, and the Product included in the subscription has\d a shipping charge associated with it, this setting would allow you to set that shipping charge to 0 for the Trial Period. If the Trial Price is also 0, the customer will be given a completely free trial. SubscriptionBridge supports a multi-lingual front-end (the Merchant Center, instead, is only available in English at this time). Therefore, you can add Names & Descriptions for your Packages in each of the languages that you have activated for your store. To do so, navigate to the Packages page as described above, and then click on View/Edit in the Descriptions column. On the page that is displayed, click on the “Add New Description” button to add the following information (the screen shot below gives a graphical example of how this information is shown in the SubscriptionBridge shopping cart). Select a language from the list of active languages for the Store. Languages for which you have already entered a name/description are not shown. Enter a name for this Package in the Language you have selected. The package name is shown to customers in all e-mails and other customer-facing pages (e.g. in the SubscriptionBridge Shopping Cart, Customer Center and in all e-mail Notifications). Enter a friendly name for the Trial Period (e.g. “Summer Special - 2 Months at 50% Off”). This is used in e-mail notifications sent by SubscriptionBridge. Once you have added names and descriptions in multiple languages, the Names/Descriptions page will present them using a tabbed layout where each tab corresponds to a different language. To edit any of the entries, click on the tab that represents the language that you need to edit, and click on the Edit icon ( ). A Package may contain additional, optional Features that allow customers to add and remove various products and/or services to/from their subscription. For example, a gym membership may offer as optional services a “Towel Service”, a “Locker Rental Service”, and a “Laundry Service”, each for an additional fee that is added to the subscription amount when the Feature is selected. You can let customers edit their subscription after they initially subscribe (via the SubscriptionBridge Customer Center or the SubscriptionBridge API). SubscriptionBridge allows you to automate this process. A new page will display a list of Features that have been added to the Package. Enter a price for it. This is the amount that will be added to the Package Price to determine the total subscription amount paid by the customer. For example, if the price of a gym membership is 29.95/month and the optional “Locker Rental” service is $10, a customer that subscribes to the gym membership and opts to add the “Locker Rental” service will pay $39.95/month. The price that you charge for this additional product or service might be different during the Trial Period. If the price does not change during the Trial Period, enter the same price that you added to the Price field. Packages can be deleted only until they have been subscribed to. That is: until a customer has purchased a subscription that is associated with a certain package. If a Package has been purchased (i.e. there is at least one subscription that is associated with that Package), the Package can no longer be removed from SubscriptionBridge. In the Packages section, mouse over Packages. The system will display a preview of the Packages you added to that Store. Click on the link to load the list of Packages. Packages can only be deleted when not used in a subscription. When a Package is associated with one or more subscriptions, the checkbox is not shown. When no Packages can be deleted, the Delete Selected Records button is not shown on the page. Now that you have created one or more subscription packages, you can immediately start selling them, if you wish to do so. With SubscriptionBridge, this is as easy as placing a link on any Web page, e-mail message, blog, etc. Customers will purchase the subscription package (i.e. subscribe to the product or service that you are selling) using the SubscriptionBridge shopping cart, which is automatically personalized with your logo. This is what we refer to here as the ”Simple Integration” of SubscriptionBridge with your business. If you wish customers to go through a separate checkout process, you will want to use the ”Advanced Integration” or one of the ready-to-go integrations with existing e-commerce systems.